Distinguishing Characteristics Caucasian female. Brown hair, brown eyes. Helen's maiden name is Borkowski. She may wear eyeglasses. 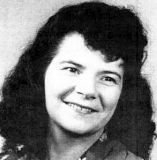 Helen was last seen in South Milwaukee, Wisconsin on or about January 12, 1946. She was having marital issues at the time of her disappearance. She never came to pick her two young children up at the babysitter's and has never been heard from again. Oddly, the date given for Helen's disappearance is also the day her husband, William P. Stark, was discharged from the Army. He had enlisted in March 1943. Helen's family doesn't believe she would have abandoned her children. Her own mother died when she was a teenager and her younger siblings were placed in an orphanage. Few details are available in her case. Updated 3 times since October 12, 2004. Last updated August 8, 2018; details of disappearance updated.